HTPB is a kind of telechelicoligomer and a new type of latex. It can be formed a 3D network structure solid with extend chain solvent and inter chain solvent at normal or high temperature. It equip with excellent dynamic performance, and the resistance to hydrolyzation, acid and lye, grind, low temp, and also is electric isolation. 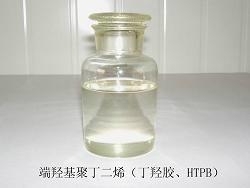 HTPB has good transparence, low viscosity, aging resistance, low temperature performance and good process capability. There are various usage for HTPB, that is to produce casting elastomer which is the material of tyres of cars and planes, also is the material of building, shoes-making, rubber product, insulate products, dope, adhesive, casting , insulation , waterproof, racetrack, wearable transfer belt, and also is modified solvent of rubber and epoxy resin. Package is to use plastic barrels of 180kg, 50kg plastic barrels, and normal chemical product transportation. The product should be kept in ventilative and dry storehouse.